The Labour Party has called on the Tory-led government to hold an urgent summit on Britain’s Accident and Emergency (A&E) crisis. The call follows data confirming the NHS missed waiting time targets in the last three months of 2014. Hospital trusts have been forced to activate major incident protocols to cope with A&E pressure. Prime Minister David Cameron has admitted the National Health Service (NHS) is “under pressure,” after statistics released on Tuesday showed A&E waiting times in England are at their worst in more than a decade. Official figures from NHS England prove that just 92.6 percent of patients were seen within four hours, which is below the 95 percent target and a marked fall on the worst performance previously recorded, since the Coalition came to power, of 94.1 percent at the start of 2013. Records show that overall 5.6 million patients visited A&E departments around Britain during the three months to the end of December last year. “A lot of the pressure on A&E is coming from frail, elderly people, often with many different health conditions and the best place for them, frankly, is not A&E,” he added. 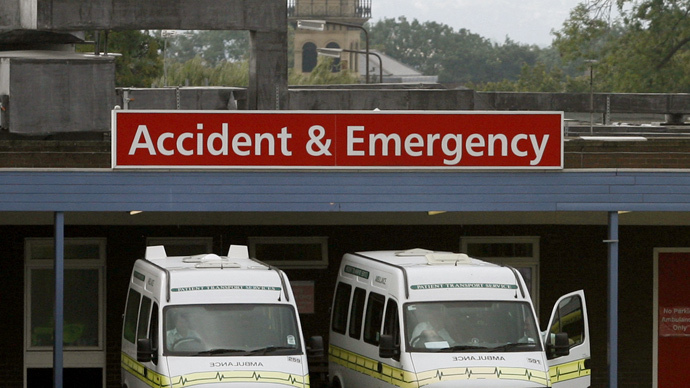 The pressure on A&E has led many hospitals to declare ‘major incident’ cases this week. Many have been forced to call in off-rota staff and cancel non-emergency care, including routine operations. “Fire engines and police cars been used as a replacement for ambulances,” Burnham claimed. Labour has made “bettering the NHS” a core element of their political election campaign. He also blamed delays on the difficulties citizens face in securing GP appointments. “Given this, and also given the rapidly deteriorating position, I believe you should call an urgent summit, including representatives from local government, the police, fire and ambulance services, as well as emergency care and other NHS professionals, to assess the situation and put in place a coordinated plan to ensure patient safety and support the performance of A&E departments across England, and minimize any avoidable further major incidents being declared,” Burnham told Health Secretary Hunt. On Tuesday, Hunt tweeted: “English A&Es remain best in world on waiting times – thanks to brilliant work by NHS staff in challenging crisis.” He also shared statistics suggesting how much A&E departments have improved over the past couple of years. “A&E staff are busting a gut to give patients timely, safe care,” Hunt added. He said the whole country should be “proud and grateful” for their efforts. Teed feels Jeremy Hunt and the Department of Health leadership knew the crisis was imminent, but “haven't done enough.” Had the department been unaware, they were “failing their basic duty,” Teed added. Despite the Labour Party’s pre-election focus on a “better NHS,” the junior doctor also blames the party’s handling of the health service during its time in office. “Labour helped cause the mess, they cannot solve it,” Teed said.